MagicQ MQ60 is part of a new generation of small and lightweight MagicQ Consoles specifically designed for travelling lighting designers. The MagicQ MQ60 fits within the hand luggage restrictions of all the major budget airlines including Ryanair, Easyjet and South West. While maintaining a small form factor, it has room to grow into. There are four patchable direct DMX outputs on the rear panel and a total of 12 universes supported for direct output over Ethernet via protocols such as; Art-Net, sACN, Pathport and Strand Shownet. The console features at inbuilt UPS which protects both the console and the Ethernet switch in case of power fail. It has low power consumption and does not require a cooling fan - enabling silent operation for broadcast, theatrical and corporate shows. With built in MIDI input and output, and an audio input for synchronization, the MagicQ M60 provides many options for integration with show control and audio systems. 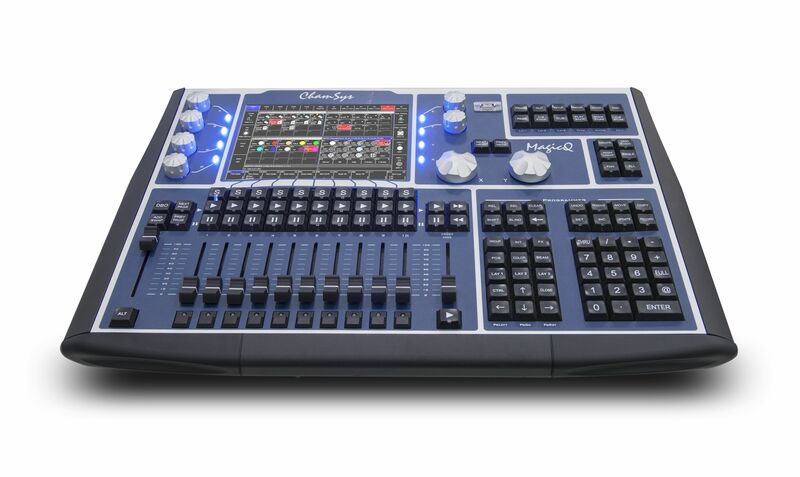 The MagicQ MQ60 runs the same MagicQ software as other MagicQ consoles, meaning that shows programmed on it can be loaded and ran on any other MagicQ console (within the universe limits). Likewise, files created on one of the other models can be saved and played back on the MQ60. This scalability is one of the core design principles for all of ChamSys lighting controllers. Show files are forward and backward compatible across software release versions and new features are regularly added to the software.